Women's contributions overseas and on the homefront during World War I paved the way for all women serving in the U.S. military today, American Legion Past National Commander Denise Rohan told an audience Nov. 8. The first woman elected to lead the nation's largest veterans service organization, Rohan joined other modern-day trailblazers at Pershing Park in Washington, D.C., in a tribute to women who supported U.S. efforts in the Great War. Speakers included retired Adm. Michelle Howard, the Navy's first female four-star admiral, and retired Rear. Adm. Margaret Kibben, the first woman to serve as the Navy's chief of chaplains. "History reveals that these women, those who served in uniform and those who worked outside their homes, helped expedite the passage of the 19th Amendment in 1920, as their male counterparts began to see females as equals," said Rohan, a Vietnam-era Army veteran. "Those men elected to give women the right to vote. Step by step, these women helped lead the way to the 1948 law that made women a permanent part of the military services. Step by step, all the servicewomen who came before laid a foundation for the defense secretary to open combat jobs to women. These seemingly ordinary women who wore the uniform did extraordinary work, representing the very best our country has to offer." 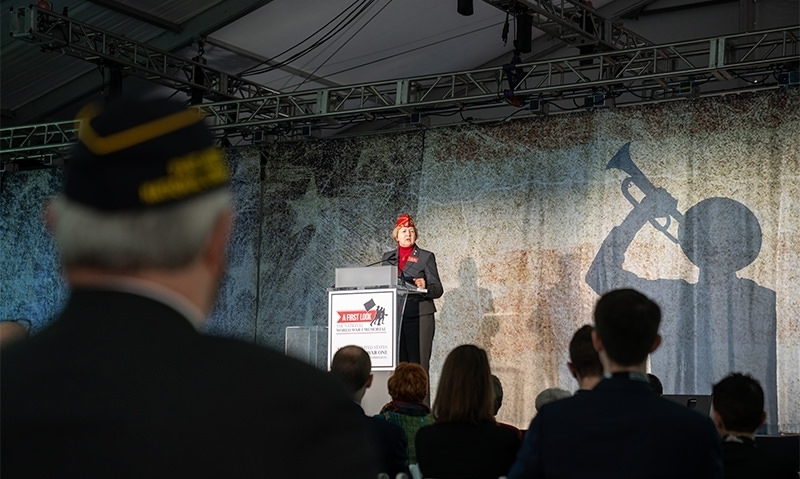 Deborah Anderson, a commissioner for the U.S. World War One Centennial Commission and the first woman to serve as quartermaster general for Veterans of Foreign Wars, said it is vital to build a new national memorial honoring every American who participated in the Great War -- including women. "War is not just about battles, campaigns, nations," said Anderson, a Gulf War Army veteran and Bronze Star recipient. "War is really about people, and that's what memorials are about: people. One hundred years ago, 4.7 million Americans went off to fight a war that changed the world, and 116,516 Americans made the ultimate sacrifice. Here in our nation's capital we have memorials to Vietnam, Korea and World War II, but there is no national memorial to those who served in World War I. Now, here in this park, there will be." Of the women of World War I, Anderson said, " Those of us who have served since then stand on their shoulders. We were able to do what we did because these women proved what they could do, showed their grit, and served proudly and bravely." In an invocation, Kibben offered thanks for such women as Chief Yeoman Loretta Walsh, the first woman to enlist in the Navy, and Army nurses Edith Ayers and Helen Wood, the first female servicemembers killed in the line of duty when a ship's gun exploded during a practice drill en route to France. She also praised women who volunteered for the Red Cross, the YMCA and other groups, as well as those who filled the jobs of men called into military service. "Our country's fabric has been made strong by the thousands of women who sustained industry, stepping up to staff vacated offices and overwhelmed factories, or managing households, raising the next generation while war ravaged their families and stole away their husbands, sons and brothers," Kibben said. "We recognize and celebrate the countless sacrifices women made over a century ago." Howard began her speech by reciting a few lines from Canadian physician John McCrae's "In Flanders Fields," the classic war poem that forever linked poppies with the millions of lives lost on Europe's battlefields. If the men are the poppies, the women have their metaphor as well, she said. "McCrae wrote, 'The larks, still bravely singing, fly / Scarce heard amid the guns below.' The women of World War I, so many of them were bravely singing, but the guns were so loud, so present, we can scarce hear the echo of their voices today. They were there on the battle front, in the field hospitals. They were there, as clerks, radio operators and translators for the military. These women were there, in the war." Though McCrae died in early 1918, months before the Armistice, he would have seen women helping carry the torch, Howard added. "If the dead sleep peacefully, it's because the women, the larks, sang bravely. Their song has been muted by the passing of time, over 100 years, and we are here today to remember their contributions and pray that they too sleep undisturbed as the poppies grow." The Army and Navy had nurse corps when the United States entered World War I, their numbers about 400 and 160 respectively. By the end of 1918, more than 22,000 women had served as military nurses, not only caring for the war's wounded but fighting a devastating influenza epidemic. At least 10 Navy nurses died after treating the ill, three of whom received the Navy Cross. And of the 38 Army nurses buried overseas, most died from the flu. The war opened the door for women to serve in other military jobs, too. Wanting to free up as many male sailors as he could for the fight, Navy Secretary Josephus Daniels asked where the law stated that yeomen had to be men. Since women already dominated the growing communications field – Remington had long employed women to demonstrate use of the typewriter, and at the turn of the century Bell Telephone had 37,000 women on switchboards compared to 2,500 men – the Naval Coast Defense Reserve began recruiting women. Initially, the yeoman (F) was to perform only administrative duties, but as the war ground on, they worked as truck drivers, cryptographers, telephone operators and munitions makers. "So much for the slogan, 'Gee, if I was a man I'd join the Navy,'" Thomas said. "The yeomanettes could tell potential sailors, 'I'm a woman and I serve. So can you.' By the war's end, over 11,000 yeomanettes had bravely sung their songs." Following the event, distinguished female representatives of each service branch placed wreaths at the Gen. John Pershing statue: Army Sgt. 1st Class Jasmine Joyner; Rhonda Amtower, president of the Women Marines Association and the first female Marine attache to serve at the U.S. Consulate in Hong Kong; Lt. Cmdr. Alexa Jenkins, president of the Sea Service Leadership Association and the first Jewish woman to command a Navy warship; retired Air Force Brig. Gen. Wilma Vaught, the first woman to deploy with an Air Force bomber unit; and Capt. Lucinda Cunningham, the first African-American woman to achieve the rank of captain in the Coast Guard. For Cunningham, the program was inspiring, and a timely lesson in just how much the first generation of American women in uniform accomplished. "I am blessed and appreciative of what they did so that I could get to where I am," she said. Kibben said she appreciated an opportunity to help "raise up to consciousness this one segment of history that has been all too forgotten, and yet many people lost so very much. We share in the grief, we share certainly in the victory, but we also share in our role in maintaining peace and freedom across the globe." Learn more about the new National World War I Memorial here.